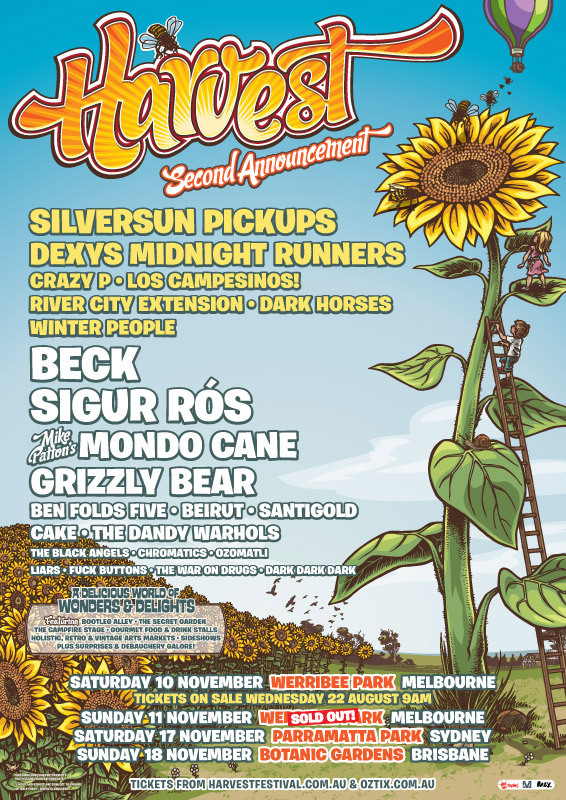 HARVEST INITIAL LINE UP AND DATES ANNOUNCED! Back after a stunning debut first year this year’s Harvest Festival will take place in Melbourne, Sydney and Brisbane in November! The first raft of acts have been announced and include top performers like Beck, Sigur Ros, Ben Folds Five, Santigold, Beirut, Cake, The Dandy Warhols and more! Tickets go on general sale on Thursday 28th June and we will have a secure link for you to buy tickets – check back then! For those of you lucky enough to be heading out the Harvest Festival next week, organisers have posted the Sydney and Brisbane time tables online with Melbourne coming soon. So you can stop panicking about clashes and plan which bands you want to see in full! 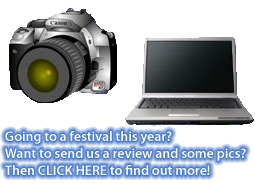 We are also looking for festival fans to write a review and take a few pics for us – if this is something you or your friends would like to do then drop us an email and let us know which bands you are planning to watch! HARVEST FESTIVAL ANNOUNCES ARTS LINE UP! Harvest Festival has announced an electrifying and expansive line-up of glam-rock burlesque, circus royalty, electro-swing idols, spoken word Institutions and over fifty art installations across the three festivals, in addition to its already critically-acclaimed music bill, this November. Enter Bootleg Alley, where decadent whimsy and dangerous glamour combine in alt-performance palace Le Boudoir. Featuring exclusive performances from Los Angeles starlet, world-class violinist, fashion icon and glam rock burlesque Queen – Emilie Autumn – touring with the infamous Bloody Crumpets; the Australian premiere of New York’s Gospel Superdiva Our Lady J; and irreverent International neo-cabaret superstars The Wau Wau Sisters. Vaudevillage, the Molotov cocktail of theatre, comedy and spoken word curated by The Campfire Collective, will open Le Boudoir in each city with all killer and no filler. With performances from Virginia Gay, Die Roten Punkte, The Suitcase Royale, and Asher Treleaven (Melbourne); Applespiel, Zoe Coombs Marr, Randy and Smart Casual (Sydney); and The Bedroom Philosopher, Ghost Boy, Skills in Time and Mel Buttle (Brisbane), plus more to be announced. Le Boudoir also brings you foot-stomping, hell-raising sets from Juke Baritone and The Swamp Dogs (Sydney), Mojo Juju (Melbourne), Clairy Browne and The Bangin’ Rackettes (Brisbane) and Kormac’s Big Band (all cities); as well as gobsmacking feats from Australia’s elite stunt masters, The League of Sideshow Superstars (Melbourne / Brisbane). Deep into the underbelly of Bootleg Alley lies The Snuff Box. Part jaw-dropping art installation, part subversive performance space, part hush-hush goodtime speakeasy, this very special secret space is hosted by performance art guerrillas The Glitter Militia in Sydney and The Jitterbug Club in Melbourne, who will both also be presenting knock-out extravaganza shows in Le Boudoir. Meanwhile, in blissful alternative area The Secret Garden, kick back to some very special guest funk, soul and reggae DJs on The Garden Stage, enjoy spoken word institutions such as Women of Letters, WeMakeUs Collective, Little Dum Dum Club (Melbourne) and Michael Workman, Caravan Slam, Craig Schuftan (Sydney) on The Campfire Stage, as well as gourmet food, boutique bars and holistic markets, in a world full of surprising pleasures and delights. A highlight of the visual arts programme is a large-scale commission for each festival from Sydney-based Tortuga Studios, in association with Mekazoic, while unadulterated sideshow fun is provided by Wacko and Blotto (Sydney / Brisbane), Umbrella Theatre Company (Sydney), One Trick Pony (Melbourne) and many more.